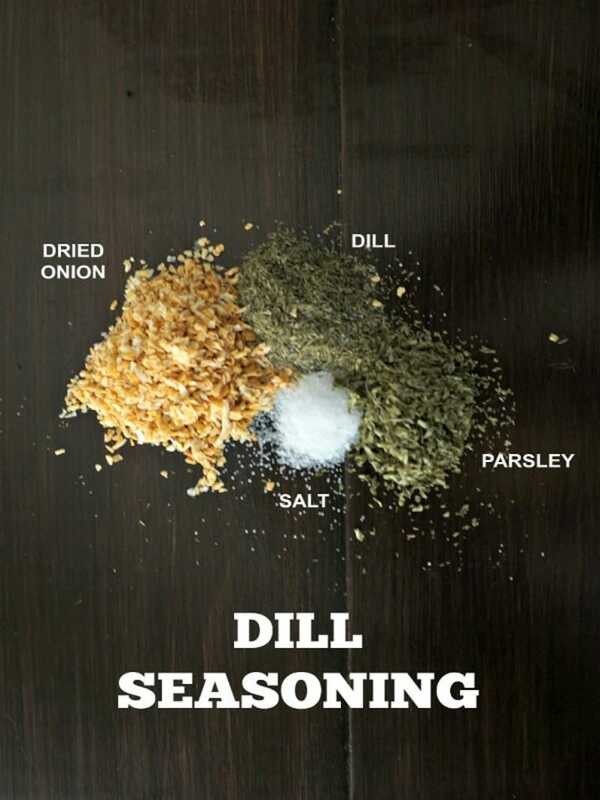 This Homemade Dill Seasoning is a perfect blend of flavors that create a perfect dip for vegetables, seasoning for fish, or bring to life Mediterranean Dishes. Looking for more great homemade spice blends? Try out Taco Seasoning, Chili Mix, and Seasoned Salt. There are a few dishes that my mom’s side of the family is known for. These are staples that are were at every family gathering for my entire childhood. And that is why I always have Dill Seasoning Blend on hand to easily whip up Homemade Dill Dip. Four simple ingredients blend together to create a simple, yet classic flavor combination. Don’t just limit using this dill blend for dill dip. It is great in so many dishes. Use to season fresh vegetables for roasting. Store Dill Seasoning in an air tight container for up to 6 months. For optimum flavor, be sure you use new dried herb–not ones that have been in your pantry for years. A homemade blend of dill mix that is perfect for vegetable dip, fish, or seasoning salads. Combine and store in air-tight container. To make Dill Dip: Mix with 1 cup sour cream and 1 cup Mayo or 2 cups plain Greek yogurt. How much of the dill seasoning goes into the sour cream and mayo? All in the recipe above? Do you have a recipe for a larger quantity? 4 or 8 oz.? Hi Twyla! Yes, the entire recipe goes into 2 cups (or 16 ounces) of dip. Are you looking for a larger recipe for the dip or for the actual mix? Sorry to not get back sooner. A larger recipe for the actual mix. Since I love dill dip for my veggies, it would be great to have a pint jar full already mixed up so you could just mix it in the sour cream and go. Hey Twyla! So you would mix together 1 cup parsley, 1 cup dried onion, 1/3 cup dill, and 1/3 cup salt. For every cup of dip, you would mix in 1 tablespoon of mix. Hope that helps!